Delightful 3D Christmas Cookies float against a snowy sky. 3D Christmas Cookies 1.0 is screen savers: seasonal software developed by Soft 2D. Delightful 3D Christmas Cookies float against a snowy sky as "We Wish You A Merry Christmas" plays in the background. Contains realistically modeled 3D animated images and MP3 music file. 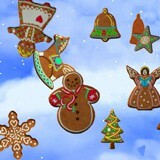 Select cookie shapes including snowman, bell, star, snowflake, gingerbread woman, angel, rocking horse, Christmas tree. Change tint to give a morning, evening or night effect, Or go wild and make everything purple. This desktop software is shareware, which means you can download and use 3D Christmas Cookies 1.0 for free during the trial period (usually for 30 days). At the expiration of the period you will have to buy the screen savers: seasonal product for $9.95. 3D Christmas Cookies 1.0 is available at regnow and Soft 2D website. 3D Christmas Cookies 1.0 supports English interface languages and works with Windows 98/XP/Vista. Latest 3D Christmas Cookies 1.0 does not contain any spyware and/or advertise modules, allowing installing it with no worries concerning valuable information loss. We has completely tested screen savers: seasonal software 3D Christmas Cookies 1.0 many times, written and published the interesting article and uploaded installation file (2199K) to our fast server. Downloading 3D Christmas Cookies 1.0 will take minute if you use fast ADSL connection. 3D Teddy Bears come to life and dance to Christmas music. 3D Toy Shop slowly comes alive with a moving train, dancing teddy bear, marching toy soldiers, a countdown to Christmas day, functional clock and calendar, a dancing snowman frolics in the falling snow outside and more! 3D Magic Christmas Toy Shop is a great gift for the winter holidays. Skeleton Santa and Jack-O-Lantern Snowman dance around a "Christmas tree". Christi's Tree is simply a Christmas Tree for your Mac. Symbols of time float before a large time symbols video as the clock softly counts down to midnight New Years Eve.